How many email addresses do consumers have and why? Here's some useful insight for email marketers who are looking to understand changes in the inbox behaviour of consumers. It's a new report from the DMA showing how busy consumers manage their busy inboxes. The research looks at a range of issues including 'ghost' accounts; unsubscribes and in-depth focus on the behaviours of younger consumers, including 'Millennials and what motivates consumers to share their email address. How many email addresses do consumers have? This is the specific question we'll look at here. The answer is... more than you might think, although as a marketer you may have more than most.The chart shows two is most common which will typically be because people have a work and an inbox email. This pattern makes life more difficult for marketers, with consumers using different addresses for different purposes, making a single customer view more difficult. 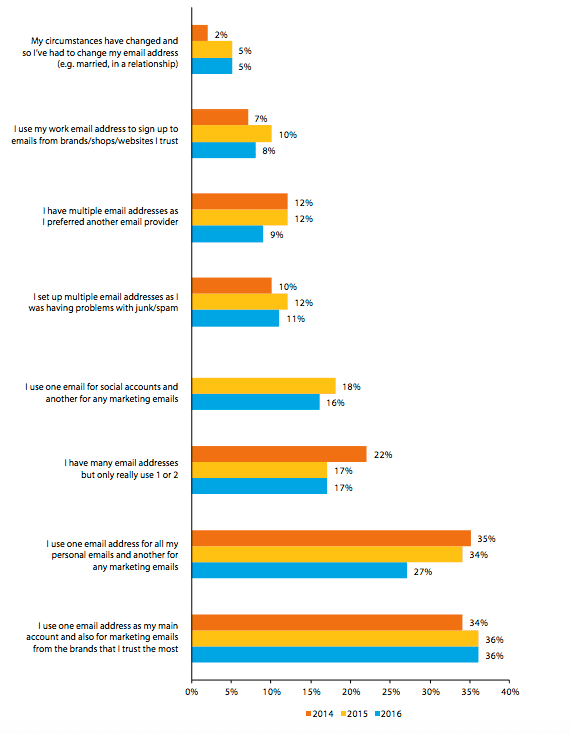 Why do consumers have multiple email addresses? Here's some more details on the 'why?'. You can see that avoiding junk/spam and having an address specifically for marketing emails are surprisingly common highlighting the need to make your opt-in appeal so powerful that subscribers view you as a trusted brand and provide you with their primary email address. Sample: 1239 responses recruited through numerous sources to demographically represent the markets based on gender and age.